As one of the most important rooms in your house, our bespoke fitted kitchens are designed around you and your lifestyle. We have bespoke kitchen furniture which will allow for most storage issues and our modern kitchens come in various heights so, you can choose the perfect height for washing up or cooking. We work with Dekton, Quartz, Corian, Granite and composite materials for beautiful, durable worktops and splashbacks. 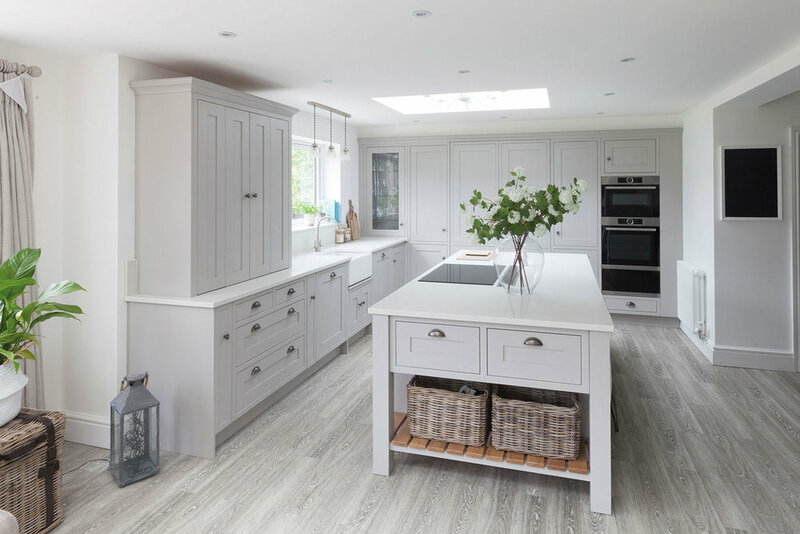 Shaker kitchen doors are characterised by a five-piece door with a recessed center panel and are a timeless style of kitchen that seem more popular than ever. Available in a wide range of cabinets with selection of colours, stains and paints, these ranges can be mixed and matched to create your own unique kitchen. The essence of a contemporary kitchen design is clean, stylish and practical. Let us inspire you with our range of modern kitchens and the power of possibilities. With 26 carcass colours as standard exuding quality from the inside as well as the outside. For open plan living we can seamlessly join your kitchen and dining area together with the clever use of different doors and textures. For a minimal, sleek and streamlined look, handleless doors are the perfect choice for your kitchen. A “true” handleless style is where the back of the door is grabbed, pulling it towards you to open. The benefits of this style of kitchen is that no fingermarks should be left on the front of the door.